It’s been said that per attempt, cave diving is the single most dangerous sport in the world. It’s dark, the spaces are cramped and you can’t easily get to the surface if something goes wrong. Going into a situation for the first time with that in mind is pretty daunting. Luckily, in terms of personal risk, there is a big difference between SCUBA diving in a cave and in a cavern and there’s plenty of locations to start gently and work your way up. An experienced local guide and good buoyancy control are an absolute must though! I was fortunate to get the opportunity to do both in one day recently. Thankfully I was diving with good friends among which is a very experienced cave diver. That said, the large quantities of adrenaline coursing through my veins told me this was still a new, challenging and somewhat scary experience. Easy to get to but still a remote dive site. Experience and planning required! 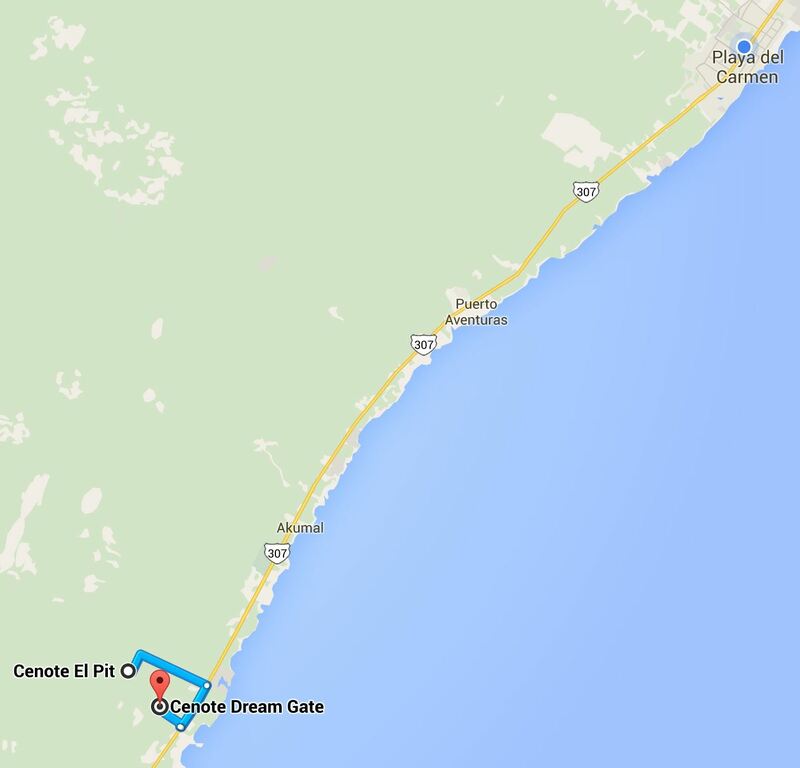 We were diving in 2 different cenotes, El Pit and Dream Gate. 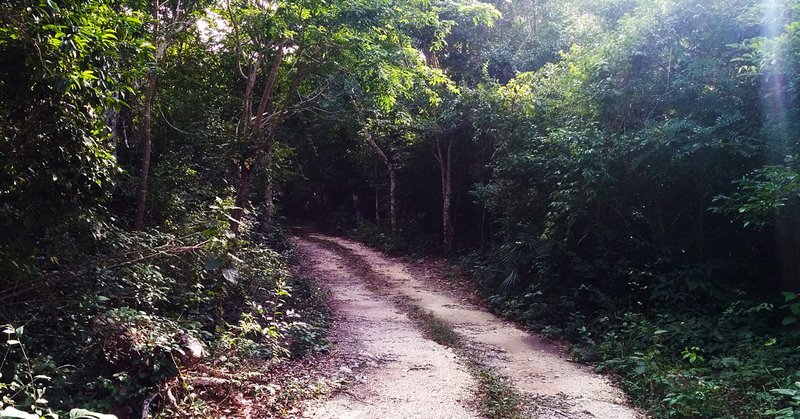 They’re approximately 45 minutes from Playa Del Carmen along the main highway. Turning off the highway for Dos Ojos to get to El Pit you quickly realise that although the cenotes are tourist attractions this is still very much a remote location. Dream Gate even more so. There is no sign for the turning and you have to drive through private property to get to the dirt track. 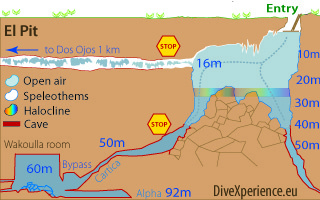 El Pit is exactly as the name suggests, a deep circular cavern and a really nice introduction to cavern diving. Next was on to Dream Gate. 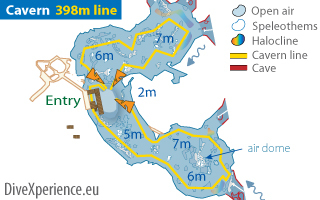 Once you’re in the cavern there are 2 routes to follow. 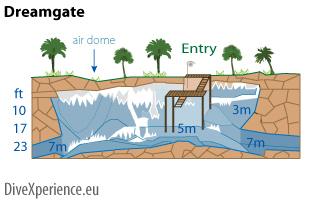 While still technically a cavern dive it’s right on the boundary of the definition of cavern. In reality it’s about as close to getting to do a cave dive as you can without a cave diving qualification. The diving companies only take experienced divers here and that can been seen in how pristine everything is. This was a truly beautiful experience. The cave formations such as stalactites and stalagmites were amazing. The maximum depth may only be 7 meters but at some points you have less than 1 meter between floor and ceiling which is exhilarating the first time you glide through such tight spaces in the pitch black. We managed to do both routes in one dive, barely saw a single other diver and exited feeling both elated and super relaxed. That said while it was beautiful, exhilarating and relaxing I wouldn’t recommend doing this dive if your buoyancy control isn’t spot on. You’ll spend your whole dive crashing into the floor and ceiling while surrounded by a cloud of extremely fine sand. As always, I’d love to hear about your thoughts and any experiences you’ve had with diving in caverns and caves. Nitrogen narcosis is dangerous, as you would sink deeper and deeper, isn’t it? So, it would men if you don’t have a buddy you are simply trapped ? Oh good spot! Thanks for letting me know mate. Thanks very much. Yep, it can be dangerous. We’ve had people try and keep diving deeper, people sometime get really sleepy and stop responding to anyone and some people act like they’re really drunk and do stupid things. That’s one of the reasons we always dive with a buddy. Miss you guys, but I`ll see you soon and will go for a cavern dive together!!! Love you both!!! Enjoy it!! 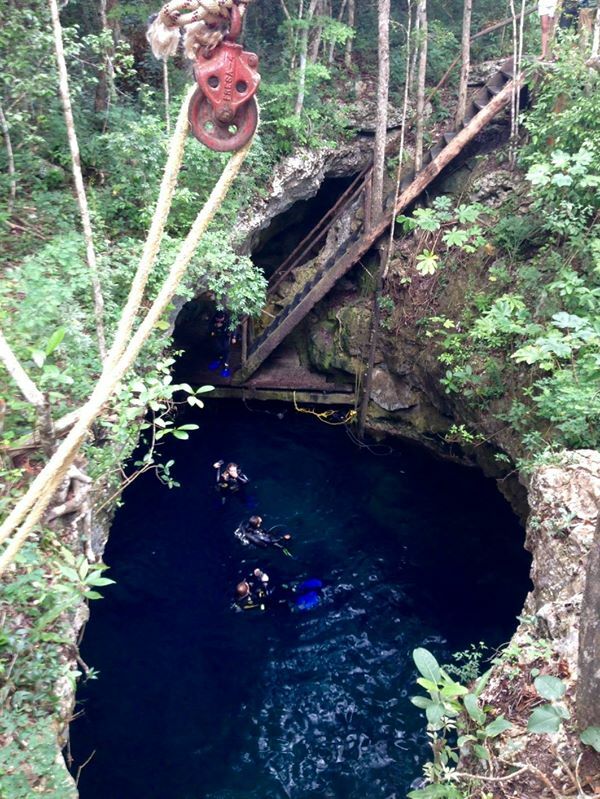 Thank you so much for this dive report and the photograph of the cenote. I am glad there is a set of stairs now because I had read other Pit reports that said you had to jump 20 feet with your gear. Can’t wait to do this dive this summer. Cheers! Glad the post was of use to you Jerry. Access is pretty easy now. The stairs are pretty steep but better than jumping 🙂 Enjoy the diving and shout if there’s any other info I can find for you. Would you recommend a guide for this dive? You mentioned a dive leader so I wasn’t sure who was in charge. — Any recommendations on hotel accommodations, transportation would be appreciated. 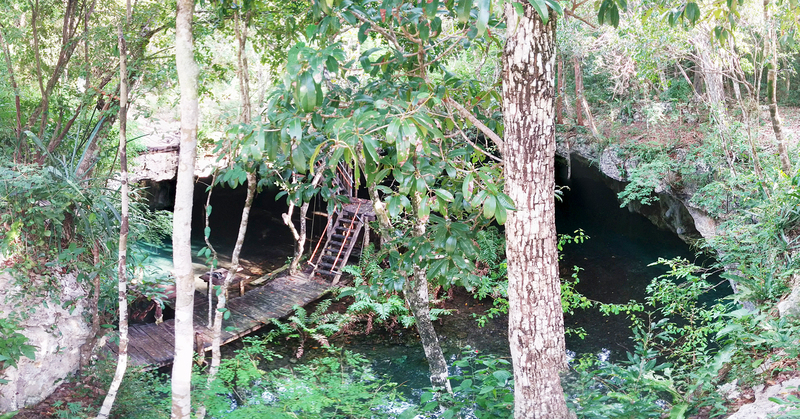 Yes, I would recommend a guide for the cenotes dives. They can be disorienting in the deeper and darker areas. I’m completing courses with ProDive Mexico and can highly recommend them. They’re a professional outfit and all of their guides are very experienced instructors. They will include transportation in their prices as well. The Yak – A chilled out hostel with good breakfast and great location. Pretty noisy though. Casa Toucan: Very slightly more up market with better bedrooms and a great location. You’re certainly brave! I suffer from claustrophobia, so this probably wouldn’t be the dive for me. It looks like an incredible time, though!